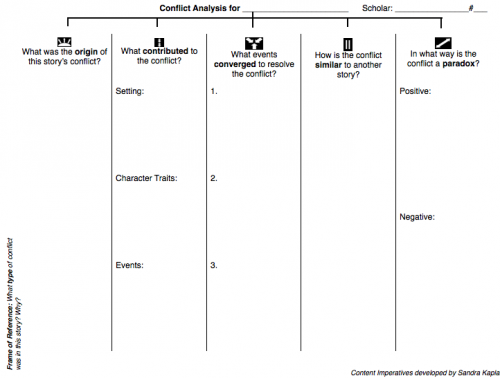 Conflict is an essential tool for analyzing literature, understanding history, and improving as a writer. Each year, my 6th graders discuss the types of conflict commonly found in stories and analyze writing using the content imperatives. I introduce and define each and then, as a class, we brainstorm examples of each. Allow a lot of time for brainstorming and justification of answers (gifted students can explain some pretty out-of-the-box ideas). This provides fascinating insight into students’ thought process. It also alerts me as to how out of touch I’ve become and keeps my own point of view from dominating the discussion. My students quickly discover that some characters face multiple types of conflict in a story. I love to use The Lion King (since it allows me to bring some Shakespeare). In this story, Simba must confront his own fears of returning to Pride Rock, he must physically battle his uncle Scar, and he must face the society that believes Simba killed his father. Identify the origin of the conflict. Look for how characters, events, and the setting contribute to the conflict. Identify three events that come together to resolve the conflict. Compare the conflict with another story. Note how the conflict is a paradox, causing both positive and negative effects. Identify and justify the types of conflict present in the story. I’ve made a PDF version available here.